Finally had the time to try making marmalade using the orange limes I was given last week. I looked at lots and lots of recipes, who knew there were so many different ways to make marmalade. Eventually I decided on Three Citrus Marmalade, substituting the grapefruit for limes. It was fiddly in respect of the peeling, chopping and trying to separate as much fruit flesh from the pith as possible. In hindsight I probably could have chopped the zest in the food processor. Verdict: Looks like marmalade, albeit a soft set one, smells like marmalade, tastes like marmalade, not as sweet as bought marmalade, but we like it. A little baking was in order, especially as I was taking the sweet part of lunch to my sewing day. So what did I make? Salted Peanut Caramel Slice -this I recipe I ripped out of a magazine, however it was acknowledged as coming from the New Zealand Cafe Cookbook. Verdict: A delicious, not overly sweet caramel slice. Quite a quick recipe to make, my only gripe was that quite a bit of the base crumbled off as I was slicing it up. Could be the cook's fault not a recipe fault though. Yes I'll make it again too. After a busy week of quick meals, I finally had a night where I didn't have to rush anywhere so cooked a nice dinner for the family. Chicken and Chorizo Paella from My Underground Kitchen. Verdict: Quite delicious, filling not super spicy at all. A new family favourite. Now that daylight savings has started, I am wanting salads and fresh flavours, instead of winter comfort food. Lets see what October has me making then. Finally made that seashell block for Miss B's Seaglass sampler quilt - it has only been a month since I wrote about making it. Made all 16 blocks for my pattern testing project - now I need to piece them together. and read and ate chocolate. Overall a good weekend. PS: The Scout, Miss B and Mr J were on a 3 day Scout hike, so I wasn't ignoring them. Mosaic of identical blocks rotated. 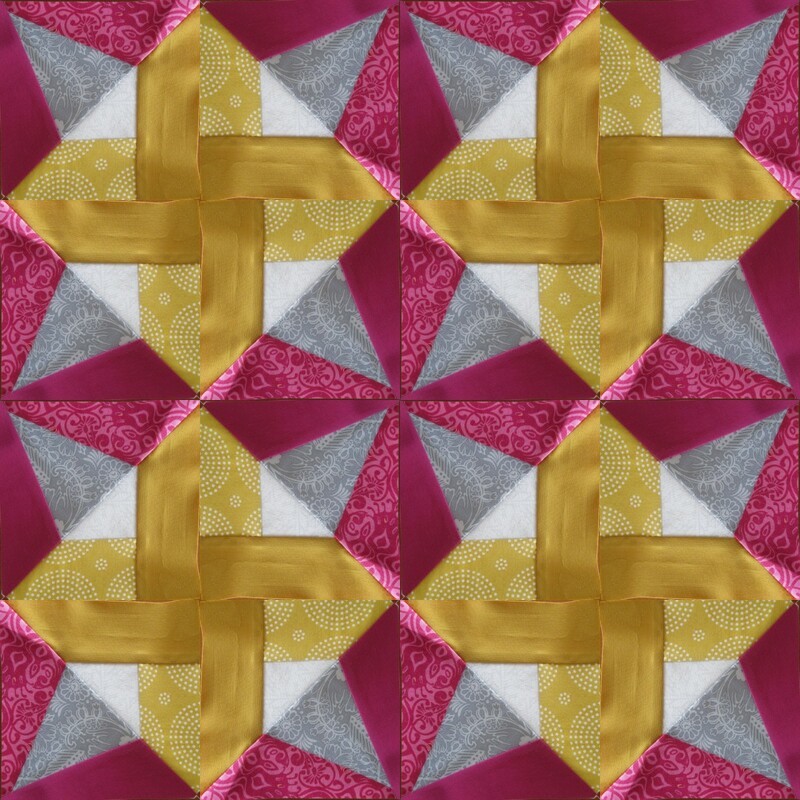 Recently one of my blog friends - Allison at Campbell Soup Diary, made a beautiful quilt to a pattern of her own design. It is paper pieced, and I absolutely love it , so was very flattered when she asked if I would be a pattern tester. Of course I said yes. Inspired by this quilt, I bought some new fabrics and raided my stash for others, with a rough idea of what I wanted to do. Allison has very thoughtfully included colouring blocks to nut out fabric/colour placement, so I spent a little bit of time making some different variations of my scheme. I made the first quadrant of a block, photographed and cropped it, then made a mosaic of what a four completed blocks would look like. Initially I didn't like it, especially since it is so different from Allison's quilt. However I persevered and finished the remaining three quadrants with some of the other planned fabrics, so I would have a completed scrappy block. My block ended up a little smaller than the 12" finished size it was supposed to (and I suspect this is because it may have been printed incorrectly by The Scout). I do quite like the look, however I am a little perplexed as to what colour I would applique in the centre of all those gold tones. I will print off some more templates from home, (lets see if these are the right size) and keep playing around, maybe I'll do one with more low volumes as Allison has done so the jewel tones POP more. Luckily this is such an easy and enjoyable block, and I have a couple more weeks to work on this. Mel's wip - a paper pieced donkey for a swap she is in. Eve of a Hundred Midnights - it is non fiction, but a very easy and interesting read so far, and I am sure it will be sad. Hope you have all had a wonderful weekend. more blocks for my #100days100blocks quilt - these are my favourite recent makes. quilting and binding the city sampler quilt - not sure if I will keep this or donate it to our local hospice - I may even have enough blocks for two smaller quilts. recovering my dining chairs with coffee sacks, could be scratchy on bare legs in summer, though they may soften with use. Is anyone else thinking about projects for next year? Eating //Sour Cream and Chive potato chips. Making // more 6.5" blocks for my City Sampler quilt - 25 done so far, only 75 to go. Thinking //about making marmalade with these orange limes I have been gifted. They are sour!! Dreaming //About renovating my living areas. We spent the weekend in Cambridge at The Scout's parents. Miss B and I had a day browsing the shops and lunching with my Mum. Sunday, saw us celebrating father's Day, with a family brunch at my in laws. Spring was definitely in the air (and not just the pollen), lots of blossoms, blooms, happy chooks and daffodils. At the beginning of the month I joined a photographic Flickr group called Macro Mondays. Each Monday we are given a theme to photograph, and then we post the photo, the following Monday. Some have been easy (flowers) some require thinking outside the square and some have been rather difficult (In the mirror). I don't have a big fancy professional camera, just a small Canon Ixus 160 digital camera, that I am still learning about. Of course, if I read the manual I downloaded, it would probably make things a lot easier. Linking up to Wandering Camera at Whims & Fancy.